► What is the Grossan Nasal Irrigator? ► What is it used for? ► Why is it effective? ► Who advocates its use? ► Is it an expensive treatment? ► At what age can someone start to use this treatment? ► Can it cause otitis? ► Are there any cheaper alternatives? ► Are there a more advanced model? What is the Grossan Nasal Irrigator? It is a nasal irrigator for external use developed by Dr. M. Grossan (Los Angeles, CA, USA), an ear, nose and throat specialist, to perform nasal and paranasal sinus lavage using the Pulsatile Saline Irrigation system. 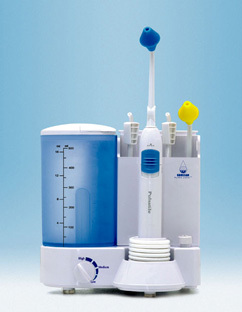 It is used as an attachment for the WaterPik (WP) oral irrigator, a device for oral hygiene. The WP provides the pump and the reservoir in which the saline solution is prepared. The Grossan irrigator tip terminates in a fixture through which the liquid comes out under pressure, and which is placed alternatively into the right and left nostrils. The lavage solution (warm tap water with Sinusal) enters through one nostril and comes out through the other, carrying the mucus, pus, scabs, etc. with it. The system enables both the nasal fossae and the paranasal sinuses to be flushed. Add 1 sachet of sinusal (containing 5 grams of special salt for sinus lavage) and 500 ml of warm tap water to the reservoir. Adjust the pressure of the WaterPik to achieve a jet of only 2 cm. Put the irrigator tip against the nostril, with your head tilted slightly forwards. Change nostril every 2 minutes. Stop the lavage when the water exits with no secretions and you have used at least 1/3 of the reservoir. 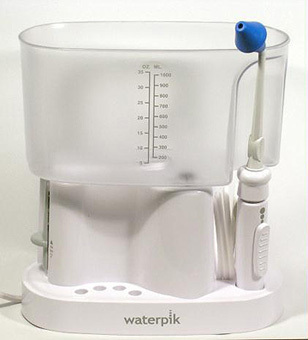 Clean the WaterPik with salt-free water, allowing it to run for 1 minute. To empty the sinuses of the saline solution, lean down (as if you were going to pick up a coin off the floor) and turn your head to either side to find the position in which the sinuses drain best. Pulsatile Saline Irrigation is used in all types of rhinitis and/or sinusitis, as well as for the treatment of postnasal drip and cough due to sinusitis. Pulsatile Saline Irrigation is particularly useful for the treatment of chronic sinusitis, to relieve the sensation of burning after endoscopic paranasal surgery and, in general, for any disorder which affects the functioning of the mucociliary system. It can be used regularly to prevent sinusitis in susceptible patients (patients with immunodeficiencies, HIV+, cystic fibrosis, allergies, asthma, etc.). It can also be used for personal hygiene, to remove pollutants, allergens, etc., especially in activities with exposure to organic and inorganic dusts (bakers, quarries, etc.). Other uses include snoring of nasal origin and blockage of the ears during air travel or diving. The lavage is performed with a sufficient volume of saline solution (typically with 500 ml), permitting an in-depth flushing of the mucus from the nose and sinuses. It is not, therefore, a simple nasal humidifier or irrigator. The lavages re-establish or increase the mucociliary clearance. The lavage is performed with a pulsatile flow at an ideal pressure and in just a few minutes. The pressure is controllable, allowing a good lavage action but without the danger of forcing purulent secretions into the middle ear. Medicines can be added to the lavage fluid if recommended for specific treatments. The lavage eliminates the particles stuck to the nasal mucosa (pollens, diesel particles, etc. 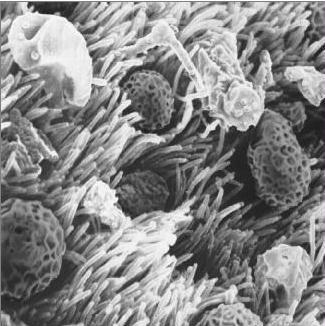 ), as well as local inflammatory mediators, improving the symptoms and reducing the rise in specific IgE to the pollens that occurs during the pollination season. Pulsatile Saline Irrigation is recommended by a growing number of authors. There are more than 30 medical publications which emphasise its properties and more than 500,000 units have been sold in the USA. Pulsatile Saline Irrigation is very economic as there is no limit to the number of lavages that can be performed with minimal running costs (water and sinusal). The tips are interchangeable and a single WP unit can therefore be used by several people. Furthermore, you acquire a device (WP) for oral hygiene for family use. At what age can someone start to use this treatment? From 4-5 years of age, once the child can perform the operation by himself. 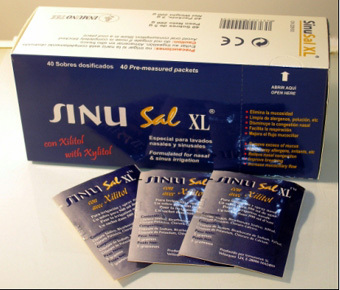 Naso-sinus saline irrigation is not painful; in actual fact it is pleasant, as it is performed with warm water and an isotonic solution. However, some patients with sinusitis may note mild sinus pain during the first day or two of treatment; this is associated with the expulsion of a large quantity of yellow or greenish mucus and usually resolves spontaneously over the following days. Pain does occur if the solution is made hypotonic (too little salt) or hypertonic (too much salt), and you are therefore advised to put exactly 5 grams of sinusal into 500 ml of warm water (1 sachet of sinusal contains 5 grams). Pulsatile Saline Irrigation increases mucociliary clearance and thus improves the function of the Eustachian tube, thus improving the ventilation of the middle ear. It is therefore recommended for those individuals who have problems of pressure compensation (ear pain when diving or in an aeroplane). The solution enters the nasal fossa and overflows into the paranasal sinuses on that side, flowing out through the nostril on the other side, thus avoiding high pressures reaching the middle ear and causing otitis. However if the nose is blocked, a vasoconstrictor can be used (for example 2 puffs of Otrivin into each nostril) 10 minutes before the irrigation. This facilitates the entry and exit of the saline solution and prevents it from reaching the ear. Note: Just as with any another nasal vasoconstrictor, Otrivin MUST NOT be used continuously for more than one week. 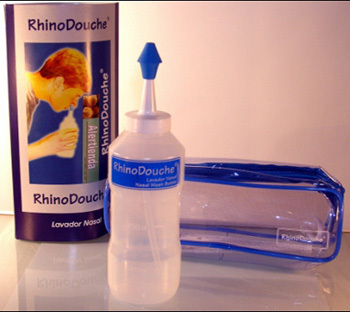 Yes, you can perform effective Naso-Sinus lavage with the RhinoDouche system. The lavage system is the same but, in this case, instead of the saline solution being pumped by an electric motor, it is pushed out of the irrigator tip by your hand squeezing on a plastic bottle. Are there a more advanced model? Yes, its name is Hydro Pulse. This device uses a pulsating stream to gently move nasal cilia. Encapsulated motor assembly to resist corrosion from additives. High performance, consistent pulse rate, and variable pressure control. Designed specifically for sinus irrigation. Not a high pressure oral device. Container designed for adding antibacterial or antifungal agents. FDA registered for nasal irrigation and UL approved.